Contains the protein sequences matched by peptides found in the experiment, and associated names, descriptions, and taxonomy IDs for those proteins. This will typically come from the FASTA file used to search the data. 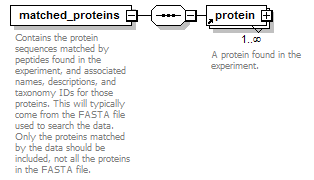 Only the proteins matched by the data should be included, not all the proteins in the FASTA file.